It's the first official weekend of December (some how) and we have yet another busy weekend! Today we have soccer playoffs (one game down, one to go), a birthday party and a basketball tournament game. Tomorrow (weather permitting) we will put up our Christmas lights (and when I say "we" I really mean my husband will), take the kids to go get our tree and then decorate the inside of the house! I love love love this time of the year!! With all of those things about to happen, I figured I should start this weekend off right....with a cocktail. 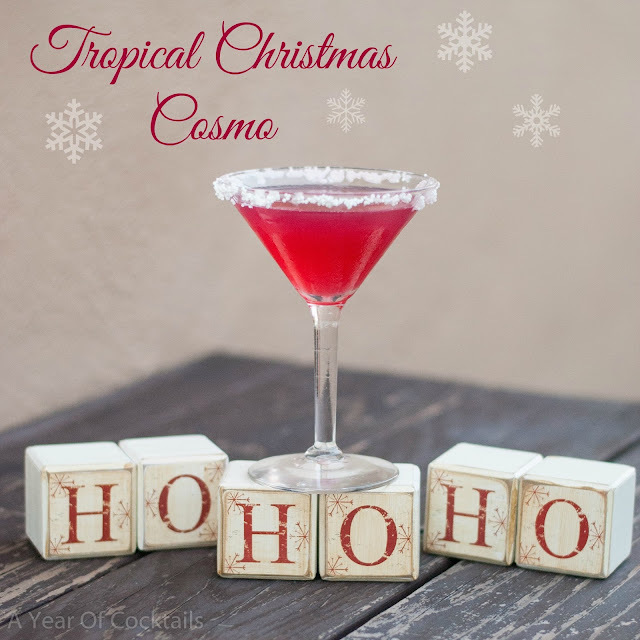 I present the Tropical Christmas Cosmo. I got a chance to use my Pinnacle Tropical Punch vodka, yum!! This cocktail kind of reminds me of Hawaiian Punch, which if you are in the mood for it, is a good thing!! I am going to try my hardest to start blogging and giving you all more cocktails then I have been lately. This year has been jammed packed with lots and lots of amazingly fun things and it is finally slowing down........or not so much with Christmas right around the corner. Either way, my calendar seems to be a little bit more open for cocktails!! Yea!! I hope you all enjoy your weekend! I'd love to hear about what your plans are below!